As an anthropologist, March 15th has always been one of my favorite holidays in China. It's International Consumer Rights Day/ 国际消费者权益日, the day when there are tables set up in public for consumers to learn more about their rights, the streets are festooned with red banners encouraging citizens to envision themselves as consumers, and the media is full of gruesome, horrific, tragic stories of consumption gone wrong. For one day everyone in China focuses on the widespread effects of the unregulated greed and economic desperation that fuels shoddy manufacturing, counterfeit products, lies in advertising. All in the name of creating a better kind of Chinese consumption and a Chinese consumer class (if you can call it that) that can exercise rights (if you can call them that) and is actually encouraged to demand that its rights be attended to. These rights are the rights that can be expressed, pressed, and propagated. Meanwhile, other rights are seen as unjustified. Sina BBS is giving prominent position to a Sina blog post now become open BBS thread, called 315: Let's stick up for our rights together and speak out. Sina BBS front page is also collecting related posts from blogs and BBS around the country with titles like "Netizen eats nail in Tangyuan cookies," and "These comfortable sanitary pads had flies inside." 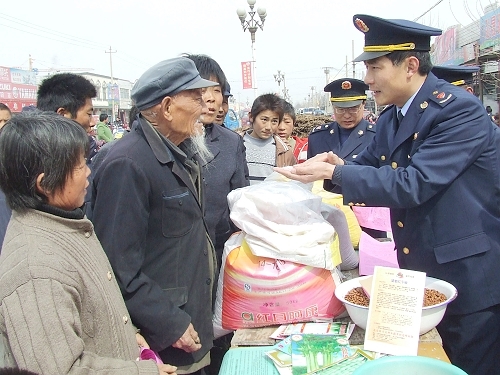 As 3.15 draws near, the main subject of 2008 3.15 International Consumer Rights Day has already been set, namely, consumption and responsibility. It is the responsibility of our whole society to protect the rights and benefits of consumers, and all concerned parties should together strive to do the work of standing up for consumer rights, improving the consumption environment, and pushing for faster, better economic and social development. In the past few years the home furnishing market has been hot and there are many impressive signs and billboards with slogans such as "China's famous brand furnishings," or "Furniture products exempt from [tax? ]," all of which bedazzle consumers. As another Consumer Rights Day arrives, why don't we all describe our experiences from remodeling and buying furniture in the past year? Speak out freely, net-friends, use our own strength to protect our rights and interests. It's another 3.15, and again one thinks of standing up for the rights of the common people. Actually, standing up for commercial rights is relatively easy but there are some kinds of rights that the common people don't even have anywhere to go to discuss! For instance, Kunshan, Zhou Village officials and the common people have been playing a cat and mouse game. At present our economies are developing quickly and there's an endless stream of illegal buildings. Zhou Village called for a halt to all private buildings. But if there's demand there will be illegal building! You would build, they would take it down, and there wasn't anything more to say about it. But then it turns out that some are out of the ordinary and can't be taken down! The reason, officials say, is that before a certain date it didn't count as an illegal building! Then the people build more and they take them down again but there are always those that don't get taken down and the officials once again say that before such-and-such a date they don't count as illegal. It's made it impossible for the local cadres to know what to say to the people. The work can't be done and there are all these illegal buildings. The officials up above say: get rid of them! The local officials never agreed with the this way of doing things anyhow so they say they've got nobody to do it. The officials say: get rid of them! We have money, we'll call up a truckful of migrant workers and level a couple of small potatos' buildings. Those who are in official positions are really disappointing us these days! Those illegal buildings mostly belong to low-income people, and some of the cadres don't do things in the interest of the people but just according to their own purposes. How can we establish a harmonious society with these kinds of officials? If you want more, Baidu has a bunch of related videos. 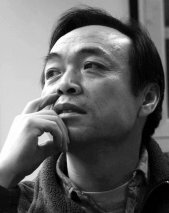 鲍昆 Bao Kun is (according to billsdue) a renowned photographer in China, who joined the Chinese Photography Association in 1983 and also taught at the University of Science & Technology Beijing. Danwei and billsdue have already blogged this stuff, but it's just so brilliant that I have to repost! China's most popular indigenous MMO, ZT Online (征途), which is run by a guy who got rich selling a vitamin tonic, is described in a Southern Weekly article that was taken down after its publication online, but translated into English by Joel Martinsen at Danwei. When you take the time to read the details of the game and the design of the system, it's a bit frightening. It reminds me of the mentality behind some of the Chinese chuanxiao pyramid schemes that I studied in the 1990s. Crazy, crazy situations, where entire business organizations spring up to use the crudest psychological manipulation to extract money from their "members," who often are there because they crave or need social or financial status. In the case of ZT Online, it looks like there is a network of salespeople who pull people into the game, ramp up competition in face to face encounters in web cafes; and then the system itself uses all the tricks at its disposal to get players to spend more money. 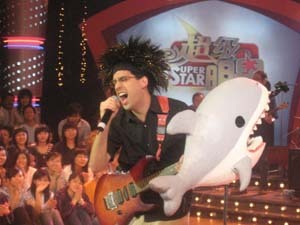 Tens of thousands of RMB, to become a really powerful player. It's also similar to chuanxiao in that the collectives organized by the system turn and revolt against the system, in this case holding mass sit-ins inside the game. As playnoevil says, "Take everything you "think" is good MMO design and turn it on its head." The game is run by Shi Yuzhu of Giant Interactive Group, who was recently named one of the ten most influential entrepreneurs of China by China Entrepreneur Magazine. A newly-born ID is at level 1, while the most courageous heroes among the kings can reach "reincarnate level 170": after bringing a normal character to level 168, they gain a new incorruptible body and can reach level 170. Simply put, this is the difference between a mortal and a god. Heroes wield "Perfect Sacred Weapons", and they are enveloped in the purple aura of nobility, while you stand empty-handed, clad in only a pair of shorts to hide your nakedness. Now you can purchase a point card to pour RMB into your game account, allowing you to ascend levels more quickly and purchase precious materials with which to craft equipment. You do not have to spend money; if you don't, if you only sit there within the game, then the system* will take not even a single penny from you. But you will quickly discover that you are unable to kill even a mosquito in that wasteland, and your movements are restricted to the place where you were born, a small village called Qingyuan; the wide world outside is for heroes. Of course, even more discouraging is the fact that you, a descendant of royalty, will live forever under the threat of another player's secKill. ...One day in 2007, at the web cafe that Lu Yang frequented, a salesman appeared in front of her while she was running around. He was smartly dressed, wore a smile on his face, and spoke in alluring terms of ZT Online, a new kind of game. "There's absolutely no need to thread mazes. We just want you to be comfortable," Lu Yang remembered that he guaranteed. So Lu Yang and her friends went on to ZT Online. These friends were her colleagues at the hospital and her husband's business partners. They were not short of money, but they had little free time. They quickly discovered that ZT Online was indeed a wonderfully satisfying game, as if it were designed expressly for people like them. You do not need to waste your effort to find a NPC to give you a mission; press the F key and a drop-down menu displays character names set out like hyperlinks. Double-click a name and you will automatically be taken to them. If you want to go to a particular location, there is no need to thread a maze. Open up the map, find a place name, click on it, and you will arrive in a moment's time. ..."Personal enemy" is the social relationship most often found here; animosity also exists between clans, factions, and kingdoms. Spreading like a fission reaction, bitter animosity is something eternally encouraged and glorified. ...The pressure came not just from the game. 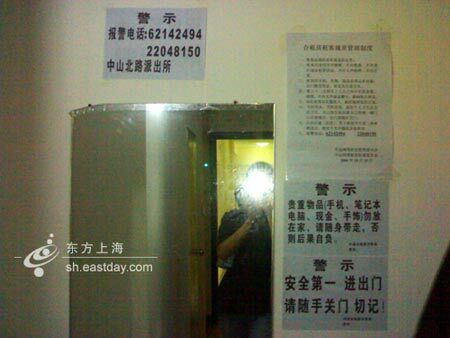 At Lu Yang's web cafe, ZT Online's promotional four-panel comic was posted even in the bathroom. When you washed your hands, you could see a cartoon character mocking those "lazy people" whose next level ascension was far off. The awe-inspiring hero in the posters tacked up at the entrance to every web cafe stared at you, and diligent salesmen frequently appeared beside gamers. Compared with various promotional offensives in the media, these salesmen are called Shi Yuzhu's "ground troops." 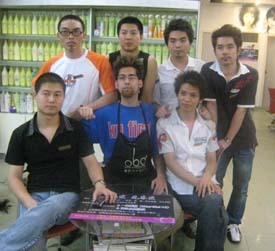 Many of them are from Naobaijin's old sales force and are active in China's major second and third tier cities. They possess a well-trained sensitivity and skill-set in digging for profit. ..."The [game] system provokes wars and we pour in our money. Whoever allocates more money is the winner." She felt that there were no winners: "Everyone's been played by the system!" ...Gamers were furious. They stopped fighting monsters, refused quests, and the kingdom's rulers sat down in a rare peace and refused to request wars. The Royal Plaza at the center of the game map was thickly dotted with seated warriors, mages, archers, and summoners. These characters, usually bent on slaughter, used absolute peace to protest the insatiable greed of the system. "Chinese gamers are an unwelcome species on European and American servers," said a game manager who once worked on World of Warcraft. Chinese players always have ways of quickly ascending levels that leave European and American gamers in the dust, and on group missions they do not like to respect the tacit rules of profit division. For those "pedantic" European and American gamers, Chinese players are like fearsome pagans. "European and American games do not encourage unlimited superiority of power; they put more of an emphasis on balance and cooperative support." The former WOW manager said, "Perhaps this is because of the influence of traditional culture and the current environment; truth be told, Chinese gamers are better suited to jungle-style gaming." I recently discovered Charles Frith's blog, Punk Planning, which details his journeys through China as a planner from the advertising world. UPDATE: David Pescovitz over at Boing Boing has discovered that the artist responsible for these is Lei Xue, a Germany-based artist from China. - Polythene sheet insulated windows... with a Snoopy decoration hanging in the middle of it. - Coal fired oven (I really have a thing for kitchens). Check out Charles Frith's blog -- Punk Planning. 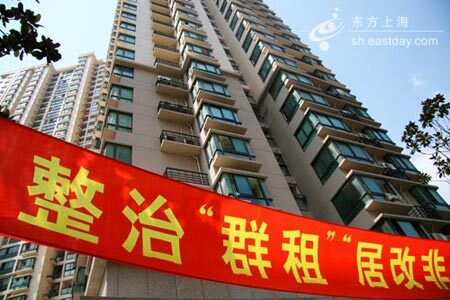 Shanghai ban on group rentals: "I don't like this Regulation"
Since September, 2007, Shanghai government released a new regulation about house renting, in which group rentals are considered harmful and have to be got rid of. Lots of apartments were checked and walls were destroyed by government people. Young people living in this kind of apartment were persuaded or even forced to sign a paper and move away in a certain period of time. 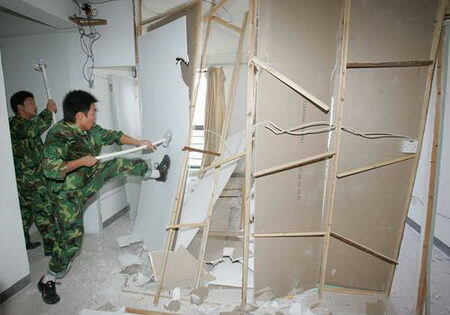 Let's take a look at some of the pictures of one task getting rid of a group rental in Shanghai. I used to be living in a 2-bedroom apartment, similar to the one in the picture above, and it was slightly changed by the landlord and rented to three people including me. Now, the landlord decided to change the apartment back to the original structure and raise the rent. So finally I had to make a decision to move, though it is not easy to find a place for only one person with that price( 1,500 rmb/month) nearby. I don't like the Regulation getting rid of group renting. Sometimes I just feel helpless and hopeless since I am not a Shanghainese and if there is no cheap, clean and convenient place to live, how could I work here anymore? Recently, it seems there are more regulations coming out every month than before. Every time I see some regulation like this, I just smile and comment: the government is just getting crazy. There is need for people to share apartments. Shanghai's real estate price just raises to be even as expensive as Tokyo, and even people with very good income cannot afford to buy a house. Where can those low-income people live? On the street? Maybe not a good idea. They have to think of ways to solve this problem. To simple solution to complicated issue.. There are many problems brought by group renting, like security, noise, damage of house... but the key is solve these problems instead of just kill the whole way of living. Policy makers just want to find easy way to complicated situation. 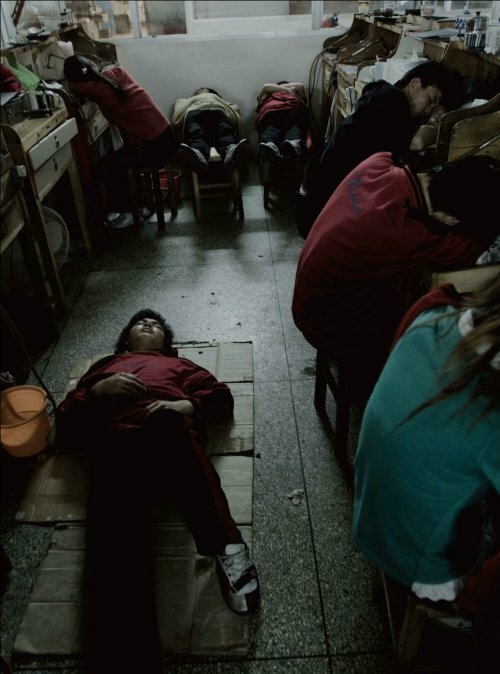 It is just like this: "How to solve the problem that the China's population is too big? ", they may answer: "Easy. Kill half of them." It sounds an easy and really working solution, but you need to respect the right of everyone, not just the half that survive. To ban group renting is the same thing. Not practical. There are so many situation that is not covered in it. The media's attention was draw to the fact that this regulation may forbidden unmarried couple to live together, or several friends living together. Some media outside China may even mis-read the rule as a way to ban Gay Couples (look at here: Shanghai Orders Landlords Not To Rent To Gay Couples). I would say this obviously exaggerated the situation since the regulation didn't mean it, although it caused similar result. 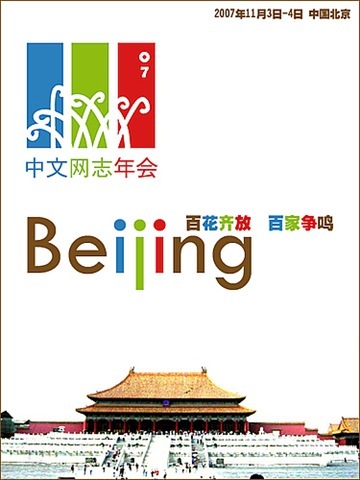 The Third Chinese Bloggers Conference was held in Beijing yesterday, Nov, 3. Around 200 people took part in the first day event. In the two-day conference, they are going to discuss and share different opinions about various topics, such as: SNS and the First Life; Wiki in Mainland China; The Chinese Bloggesphere in western scholars' eyes and why they are wrong; Art 1.5, etc. There are many other interesting topics, which can be found here. My IFTF colleague David Pescovitz, one of the editors of BoingBoing, one of the world's most popular blogs, pointed out that BB is being selectively translated into Chinese on Little Waves / 小波波 blog. This all works with BoingBoing's Creative Commons license. Nice! 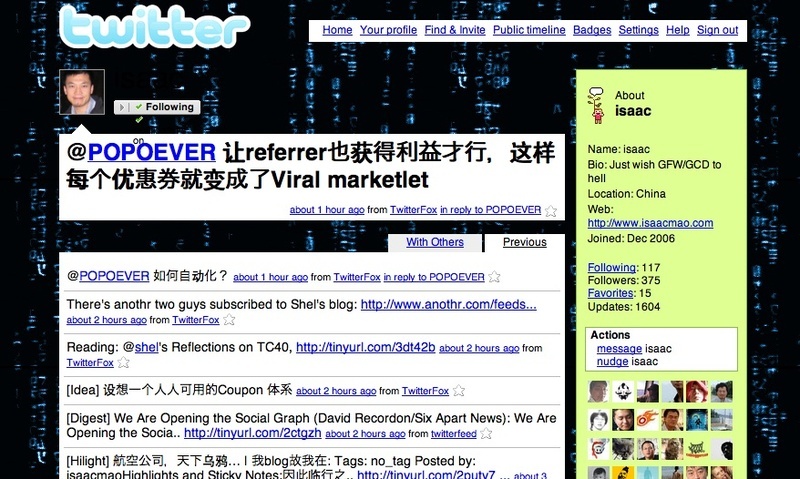 If you really cared about emerging Internet practices and their social impact in China, AND if you were trying to keep up with social media, AND if you didn't have all the time in the world to read blogs, AND if you read Chinese...you might just check out or even subscribe to Chinese venture capitalist and social entrepreneur Isaac Mao's Twitter stream. Here's Joi Ito's Twitter stream in English, which helps give an idea of how the streams can create a kind of ambient intimacy among users. But Isaac is stepping it up a level, to something that is closer to IM + blog + IRC/BBS. Not only do you find Isaac's ongoing thoughts throughout the day (such as the recent: What's up with Air China's service? The flight attendant on an international flight didn't know whether the meat in the main meal was pork or chicken, and in the end everyone voted and decided it was chicken LOL), but Isaac is using some very cool little applications like Twitterfeed, which lets you read the RSS feeds he subscribes to (blogs such as mindmeters, Techmeme, and 我blog故我在), and Twitterfox, which lets you view his buddies' Twitter updates (also known as "Tweets"). You can follow conversations across Twitter, kind of like comments back and forth on a blog or a BBS, but all on one page, and often referencing blog posts, news, and random experiences nearly as they happen. It starts to feel extraordinarily exponential...people like Isaac are moving fast with this stuff and are creating new virtual experiences and spaces as they go. 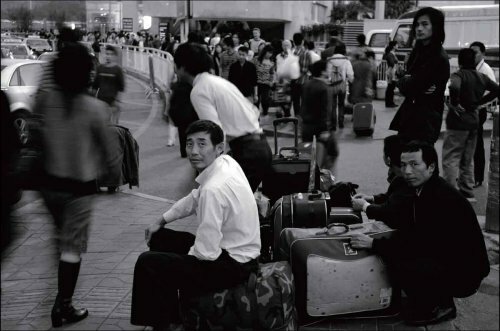 "In my experience, and (I seem to say this often) especially in China, that schedules are often floating and you spend many hours waiting for the next shot. 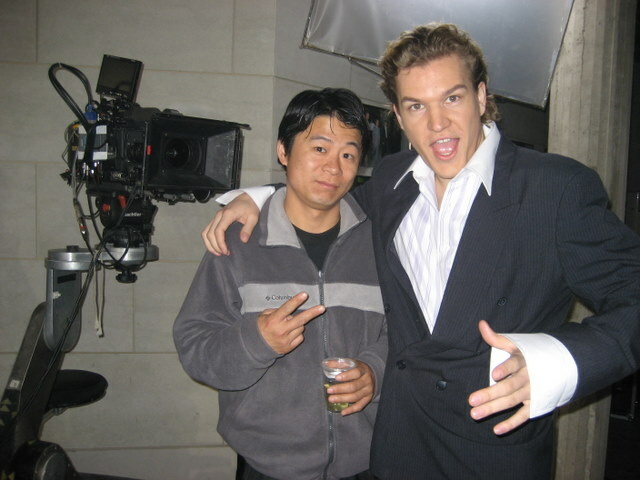 In the last movie I was filming, we had days as long as 16 hours, with only 2-3 hours of actual shooting. Unfortunately that is typical for the industry in China. Though, there is always something fun you can occupy yourself with. Some people have games, some books, or even sleep. Once you have memorized your script many times over, there is still a lot of time you have to practice your basket weaving. Though the danger of immersing yourself in a book or some other activity is that when you are called up for your scene, you have to quickly get back into character and remember the lines and the scene." "What I found the most discouraging from a humanistic perspective was that with the possible exception of Jiang who gets creative pleasure out of designing hairstyles, I can honestly say that nobody in the barber shop likes their job. Even Mr. Zheng, if presented with the right opportunity, would leave the industry if he could. There is an overwhelming sense of lack of self-actualization, and many of my coworkers view their job as pointless, literally." 1) Danielle Engelman at the Long Now Foundation. 2) EastSouthWestNorth & Ken Erickson from Pacific Ethnography.